Russian tanks crossed into Ukraine in Sorokyne District. 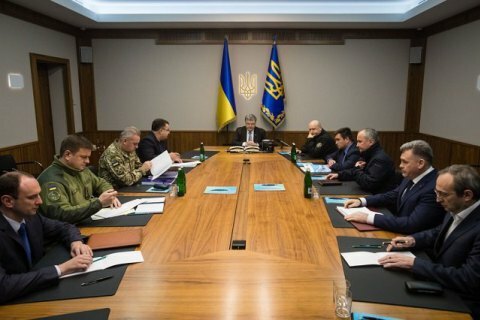 President Petro Poroshenko has convened an emergency meeting of the War Office of the National Security and Defence Council due to an escalation in rebel-held areas of Luhansk Region, his press service has said. The president heard the reports by uniformed agency heads, in particular that Russian tanks illegally crossed the border into Ukraine in Sorokyne (formerly Krasnodon) District of Luhansk Region and that pro-Russian militants had stepped up provocations. "Due to the increased number of the Russian military and activisation of mercenaries, the Ukrainian Armed Forces are prepared for any development of events to ensure safety of the civilian population," Poroshenko said. He also ordered the Ukrainian representative at the Joint Centre for Control and Coordination of Ceasefire to work in closer cooperation with the OSCE Special Monitoring Mission to keep Ukraine's western partners abreast of the situation. As reported earlier, a column of military vehicles entered Luhansk on 21 November.